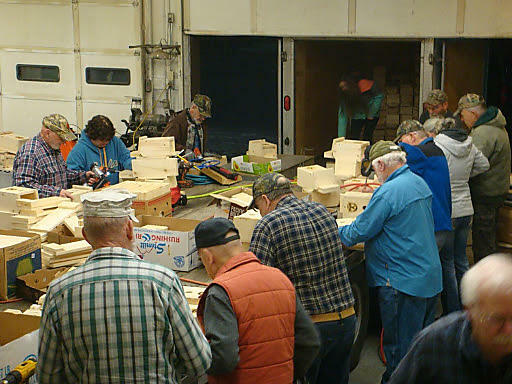 Habitat — Flathead Wildlife, INC.
18 Members of FWI got together the evening of January 25 to assemble 324 Bluebird Nesting Boxes. These were constructed from parts made over the previous month by ten FWI members: Bill Boehme, Tony Anderson, Brett Mitchell, Geo Johnson, Mike Dee, Scott Johnson, Jim Cross, Bill Matthews, Jim Vashro, & Jon VanDort. In addition to the “parts makers,” participants in the “Build Night” included: Don Peterson, Larry Rattray, Norm Brewer, Mike Wood, Sarah Yerkes, Kathy Fraser, Kylie Mercer & Mike Valler. Many thanks to Mike Valler for guiding the entire project. 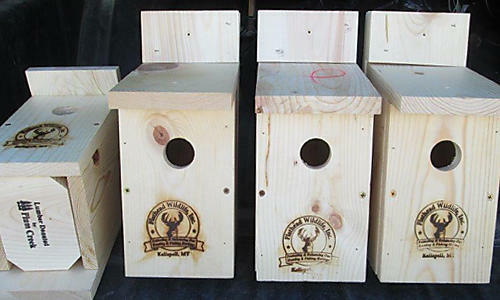 These nesting boxes will be sold at a variety of Flathead Valley outlets in time to greet returning Western & Mountain Bluebirds when they arrive with the spring. Among them are Murdochs (Kalispell & Columbia Falls) & CENEX in Kalispell. Other potential retail outlets are being investigated. Income from these nesting boxes is the major source of funds for FWI. Dollars are used to support habitat & access improvement projects in the Flathead Valley area.